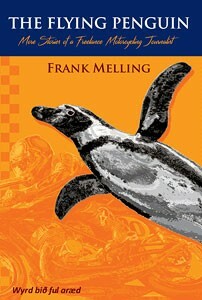 The first part of Frank Melling’s autobiography, “A Penguin in a Sparrow’s Nest”, proved to be an outstanding commercial and critical success with world-wide sales. In “The Flying Penguin”, the second part of his memoirs, Frank goes from 1985 until the present day following the same style of ripping, “Boys Own” yarns which take the reader personally through a remarkable and highly eventful life. There are plenty of near death stories, from almost drowning when trapped under a Honda enduro bike to looking down the business end of a Colt .45 in the backwoods of Missouri. The humour Melling has become so well-known for is everywhere, including how to be an imitation World Champion – when there are free hotel rooms on offer! On the way there are broken bones, broken bikes and broken relationships – all precariously balanced on the knife-edge of a freelance journalist’s permanent state of insecurity. Melling also tells the hidden stories behind his phenomenally successful Thundersprint – the biggest motorcycle event of its kind in Europe – and why he eventually brought it to an end. There are the special challenges, and pleasures, of working with fifteen times World Champion Giacomo Agostini and explaining James Toseland’s impressionist art to very tense and unappreciative Police Officers. Frank also reveals the close, and sometimes touching, relationship he enjoys with motorcycling legend Jim Redman who, through the Thundersprint, became a family friend. But “The Flying Penguin” is far more than a book of motorcycling memories. Melling is as much a historian as a journalist and he provides a fascinating, and unique, insight to the last 30 turbulent years of British social history.